All information in OME revolves around a data structure called the object hierarchy. This hierarchy defines four kinds of objects — projects, datasets, images, and features — and an organizational structure for grouping these objects together. This structure is shown in Figure 1. At the top of the object hierarchy is the project. Projects represent a large, long-term investigation, usually by either a single OME user or a small collection of users in the same research group. Each project contain a number of datasets. Projects and datasets form a many-to-many relationship; a project can contain more than one dataset, and each dataset can belong to more than one project. Most analysis routines are performed at the dataset level. This provides both a convenient batch processing capability, and the ability to calculate aggregate information about the contents of a dataset. Each dataset contains a number of images. Like projects, images form a many-to-many relationship with datasets. Images in OME are inherently multi-dimensional — they consist of pixels across the usual three spatial dimensions, and can include multiple color channels and time series. 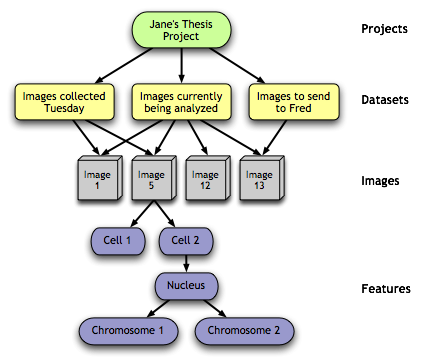 Finally, OME images can be segmented, usually via a computational analysis routine, into a tree of features. Features represent any logical subdivision of an image. Nothing is predefined, everything is arbitrary: the method used to find features, the information needed to distinguish one feature from another and from the background of the image, and what the features logically represent. The only constraint is that the features in an image must form a proper tree.